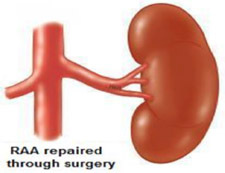 How does the normal kidney work? The blood passes through the kidneys to remove the body’s waste. The renal artery is the vessel that carries the blood to the kidney. How does a normal kidney control blood pressure? The kidney is good at sensing any blood pressure changes. When the blood pressure drops, the normal kidney makes a hormone, called renin, to correct the low pressure. This is appropriate when your blood pressure is low due to dehydration or following blood loss in an accident. The renal arteries, like others in the human body, can become obstructed. Decreased blood flow to the kidneys because of these blockages often causes hypertension (high blood pressure). This happens because the kidney then acts as if the body’s overall blood pressure is low. However, the only place the pressure is actually low is in the affected kidney itself. The release of renin in these instances unwantedly raises the pressure outside of the kidney. Arteriosclerosis with cholesterol and plaque build-up, similar to that seen in the coronary arteries of the heart, the carotid arteries to the brain, and the leg vessels. The most common age at diagnosis is 55 years. Men are affected twice as often as women. This is the mostcommon cause of renovascular hypertension (95%). Fibromuscular dysplasia (FMD) is an abnormal tissue build-up on the interior of the renal artery, causing a “string of beads” appearance, invariably affecting women less than 45 years old. This is a cause of 5% of renovascular hypertension. may have difficulty in clearing the body’s waste products and kidney failure can occur. What are the signs and symptoms of renovascular hypertension? Unfortunately most patients usually experience no symptoms of high blood pressure. The most common symptoms when they do occur are lethargy (tiredness) and extreme fatigue. High blood pressure that is difficult to treat with medicines, especially in women less than 45 years of age. Worsening of the kidney’s function to clear the body’s waste products, determined by blood samples, especially when high blood pressure medicines are needed, in particular ACE inhibitors like lisinopril. If hypertension is severe, patients may have unusual nose bleeds (epistaxis), ringing in the ears (tinnitus), and headaches early in the morning involving the back of the head (occipital cephalgia). Thickening of the heart muscle (hypertrophy) to the degree that the heart becomes “muscle bound” and heart failure occurs. Worsening of arteriosclerosis (hardening of the arteries with cholesterol plaque build-up) of all the body’s arteries. This may increase the risk of stroke, heart attacks, aneurysms, and other vascular disease. How is renovascular disease diagnosed? conventional arteriography, by placing catheters into the artery and injecting a dye that allows the arteries to be seen. This test involves advancing a small catheter (tube) through the arteries in the groin, through which the dye is injected. How is renovascular disease treated? The preferred treatment of renovascular hypertension is to restore normal blood flow to the kidney. This may be done by placing a small balloon within the artery and expanding it, resulting in a dilation of the vessel. This is known as a balloon angioplasty. In the case of arteriosclerosis, this usually requires placement of a stent(small mesh tube) to keep the vessel open. Stents are rarely needed when treating fibromuscular dysplasia. 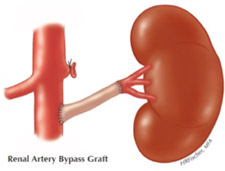 Vascular Associates of Michigan offers surgical intervention for Dialysis Access graft, fistula and peritoneal dialysis(PD CATH) access .